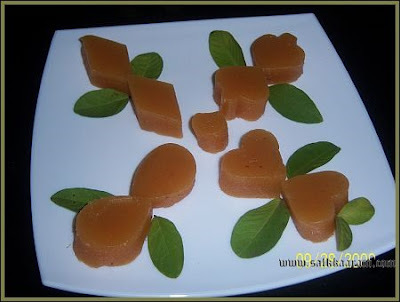 Guava Cheese | Simple and Delicious ! Steam for 8-10 minutes or until soft, a dozen big guavas cut in fours, along with a cup of water. Cool and scoop out the seeds and discard them. Pulp the guava along with the water in a blender. Measure a kg of the pulp & take equal quantity of sugar. (To get a kg of the pulp u'll need approx 12-14 slightly big guavas). Put the pulp in a thick-bottomed vessel along with the equal quantity of sugar, juice of 5 limes and a pinch of salt. Boil the mixture on a slow flame stirring every now and then to prevent it from sticking to the base. When nearly thick, add 125 gm of butter. Increase the heat and boil, stirring vigorously - till it comes away from the sides of the vessel and forms a mass. To test if done, drop a little bit of the mixture into a bowl of water. 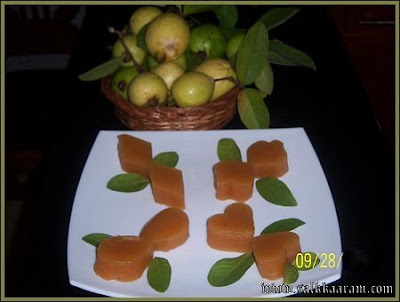 If the water remains clear without turning cloudy and mixture forms a soft ball when rolled, the guava cheese is done. Quickly pour the mixture into a greased shallow tray. Spread evenly. Cool and cut into shapes. aww it looks so pretty! wow this looks so good,..new for me,.. Delicious - one of my favourite candies!! this looks yummy and nice pic. i read this in vanitha. but didinnt have the guts to try it. IF YOU ADD A TABLE SPOON OF RICE FLOUR TO THE PLUP MIXTUR BEFORE COOKING IT WILL BE MORE DELICIOUS AND MORE SOFT PLS TRY IT OUT.